Zachary Uecker (left) receives the scholarship check from Northern Rehab’s Physical Therapist Todd Vanatta (right). We are pleased to announce and present our annual Genoa-Kingston High School 2018 Sports and Health Scholarship to Zachary Uecker! Zachary Uecker, a recently graduated senior at Genoa-Kingston High School, was chosen for his outstanding achievements in athletics, academics, and choice to pursue a career in the healthcare/sports medicine field. Zachary is a life-long soccer player and a volunteer coach for both soccer and baseball. This fall, Zachary will be attending Kishwaukee Community College working towards his Associates degree and playing soccer there. He then plans to attend Northern Illinois University in the Pre-Physical Therapy Program and ultimately becoming a Physical Therapist specializing in Cardiopulmonary Physical Therapy with the goal to work with cardiac surgery patients in their recovery and rehabilitation. 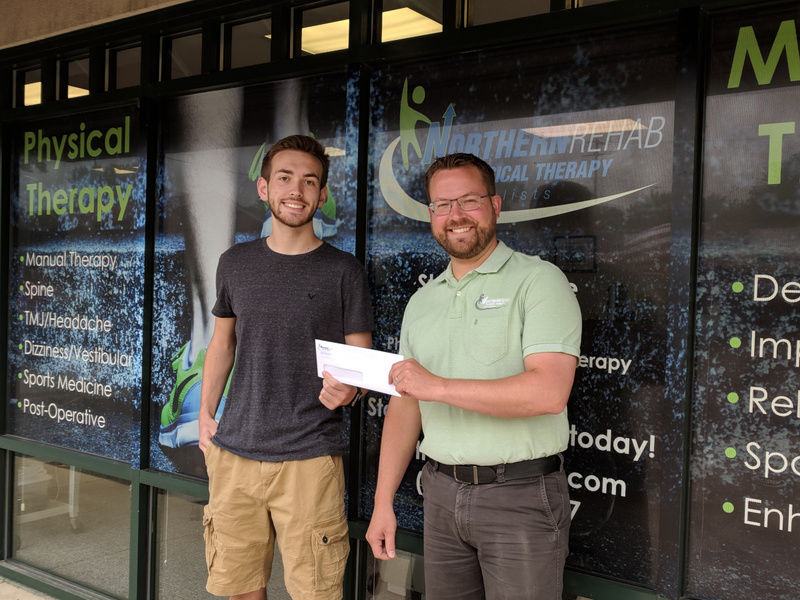 Northern Rehab is pleased to acknowledge the sportsmanship, athletic and academic excellence, and competitive spirit displayed by this year’s recipient, and we support our community in their sports and academic accomplishments and those promoting active and healthy lifestyles. Northern Rehab extends our congratulations to Zachary Uecker!